Marci Garret has watched everyone around her get married and move on with their lives. Now in her 30s, she accepts her friends' advice, and joins the 1Night Stand dating service. But this isn't your ordinary dating service. Everything about Marci's date, as arranged by the mysterious matchmaker, Madame Eve, is carefully constructed. A romantic adventure awaits! But what Marci encounters is even more unexpected! 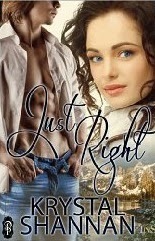 A quick read, and an imaginative contemporary romance, Just Right packs in a lot of plot for a short story! And it is a fun story, with great characters, and plenty of steamy love scenes!